Spring has officially sprung! Pack away those extra duvet covers, snow boots and hats and prepare for the warmer weather. That’s right, it’s time to put an end to your winter hibernation (effective immediately) and head outside to see the sun again. From picnicking to theme park expeditions, these are a few things you and your S.O. should be adding to your to-do list. Here is our spring bucket list for couples. The snow has thawed, the birds are singing and the flowers are blooming. Take advantage of the higher temperatures and stroll around your hometown with your partner. Don’t forget to snap some Instagram-worthy pics while you’re out and about. …Then put those fresh ingredients to good use and make dinner together. Wine is a necessity, so don’t forget to pick some up on your way home! TBH, Mother Nature is the best third wheel. You may be too old for easter egg hunts but that doesn’t mean you can’t indulge in a little chocolate (fondue, body chocolate or otherwise). If April showers are bringing you down, you can always do it in your living room! We all know summer is the busiest season for theme parks, so get in there early! You won’t have to wait in three hour lineups, making your visit one hundred times more enjoyable. It’s a lot easier when you’re not fighting snow and sleet! Pretend to be seasoned sommeliers and say things like “this chardonnay has a subtle oaky flavour” or “you can really taste that hint of citrus” (even if you have no idea). While you’re out there, have a go at recreating this iconic kiss from The Notebook. Make a killer playlist and get to scrubbing. Don’t forget to shower off together when you’re done. Better still, make your own traditional Bermuda kite. Maybe not from Ikea, though, those instructions are bound to start a fight. Watch a few YouTube videos, hit up a Home Depot and channel your inner Ty Penningtons. Hint: start with something simple like a bird feeder before jumping to an elaborate four-poster bed. Splurge on tickets for the NHL or NBA playoffs and host a viewing party for the finals. Take a vacation and get some well deserved R&R. No, you don’t have to go to Cancun or drink your cerveza from a funnel to have a good time. If you can make it a tandem bike ride, even better. On April 22, go green and do a digital detox, plant a tree or stage a black out at home (remember to stock up on candles). Don’t forget to stock up on tacos, tequila, and guac before the 4th of May rolls around. If you’re more into sci-fi than Cinco de Mayo, celebrate every amateur Jedi’s favourite holiday, Star Wars Day, instead. Rent all the movies and kick back in the comfort of your own home. May the fourth be with you. ‘Tis the season to grill outdoors, so fire up your BBQ and get to cookin’. Get your beach bodies ready for the season ahead. There are plenty of fun couples’ workouts available on the internet, so why not try a few of them? Note: if pumping iron isn’t your style, you can always work it out in the boudoir. Now that you can actually see your lawn (bye, snow!). Who knows, you may find something worthy of Antiques Roadshow. Put your skills to the test with a good ol’ game of mini golf. If you’re not feeling inspired by your own city, leave. Head to a neighbouring town and spend the day scoping out cute coffee shops and local boutiques. If you fall in love with it, book a night at a B&B near by. Swap out your whisky for gin and add a citrus twist. Bonus points if you go the extra mile and muddle mint or berries. Celebrate crossing that finish line with a smooch (or maybe more). Make your romance fast and furious. Good news, plenty of outdoor sports require only two players. Grab a couple of rackets and get competitive with a game of badminton or tennis. You might also like: The Ultimate Couples’ Bucket List! Download the 2life app and start making your bucket list using the LIST tool. 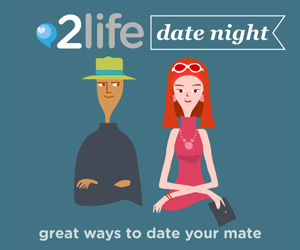 2life is the perfect way for couples to stay connected and organized. Chat, share, collaborate and coordinate with your partner, all in one colorful, easy-to-use app. Download now, it’s FREE!